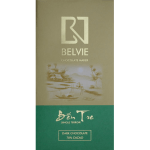 Mark Vanborren and Jannie Ha Tran co-founded Belvie in 2015 to combine their love of chocolate with Belgian chocolate techniques and Vietnamese cocoa flavours. They are passionate about highlighting the different flavours of cocoa grown in different parts of Vietnam. They pay well above Fair trade rates for their cacao, and also support local in sourcing their other ingredients – cane sugar and cocoa butter. Their aim is to support local farmers to ensure cocoa is a sustainable crop for the future.